We heard about this orphanage in remote area of Kyite Latt township from nuns at Pyin-Nyar-Waddy girls orphanage and we decided to inquire about it. Our volunteer KK went there at the end of October and donated $100 worth of supplies for the children. We decided to support this orphanage with monthly donation after KK reported back of her findings. Below is the report from the field. 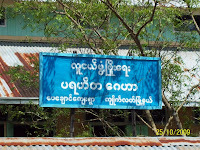 On 25th Oct, 2009, I went to 'Pay-Gyaung Parahitta" in Pay Gyaung village, Kyite-Latt township in Ayeyarwaddy division. The only way to get to this place is by boat and sampan (a motorized row boat). It is 2 hour boat ride from Kyite-latt. We started the journey at 10:00 am and arrived there at noon. Due to hot weather and the serpent-like river way, the trip was very tiring. The scenery of the river was quite pleasant but I was afraid of the many snakes swimming in the river. As soon as the boat shored, 2 boys came out from the monastery and helped us carry the things we brought. According to the chairperson of the school, there are 25 students (15 boys are orphans & 10 boys are from nearby village). Out of 25 children, 2 are high school students and the rest are middle school and primary. The monastery became a registered school in 1958-59 and started out with 26 students. The children are taken care of by the monks and a guardian. A 21 years old U Tin Ko Oo is the guardian of the school. He has got some high school education and didn't even pass the 10th standard yet. He took over the duties of the previous guardian who passed away. He sometimes has difficulty taking care of all the children. Occasionally, the school has problem providing daily food for the children. The daily meal of the children is shared from the monks 'Soon' (donated rice & curry). The school provides 2 meals a day at 9:30 am and at 4:00 pm for the children. Everyday meal for the children is "Hin-paung" (all mixed up donated dishes). For the evening meal, the children can only have some sour vegetable soup (chin-yay-hin) and white rice. The kitchen in the school is said to be used only when there is meal donor cooking. The children consume 6 bags of rice a month. The school has got 60,000 Kyats from saving account but that amount is not enough to buy 6 bags of rice for the children every month. For the children education, there is no school in that village. The monks and some other men take care of the children’s education. There is no classroom. 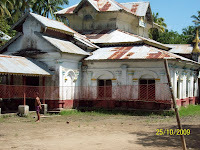 The temple buildings are used as classrooms both for the children at the monastery and the children from nearby village. Some of the middle and high school children go to the schools in nearby towns. There are only 2 temple buildings being used as classrooms. There is a library in the monastery donated by some donors from Yangon. Sadly, out of over 200 books, there are only a few books that are suitable for the children. Most of the books are about religion, witchcraft, curses and ghost stories. When I asked the children, they said that they only read some story books. They have never read religion and witchcraft books. Sometimes they rent books and they can read for on weekends. 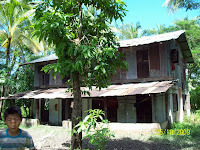 The sleeping quarter for the children is in near collapsing condition after the cyclone. The children sleep in the main building of the monastery with the head monks. Even though I saw 2 toilets, I didn’t see any bathroom for the children. The children said that their bathroom is the river. They also take bath in the river. The children also don’t have enough clothes to wear. I have been to several orphanage houses on behalf of Moegyo. I find that every new place I get to is in worse condition than the one I’ve been before. When I went to Kani Village boys orphanage house, I saw how the cyclone survivals lived and ate. Then when I got to Kyite-Latt Girls Orphanage house, I saw starving poor little girls there. With the help of Moegyo’s $100 monthly donations, the children can have enough food and live happier and more properly than before. I am always glad to see that $100 donation is made good use on their food, school accessories and clothes. On the trip to this new boy-orphanage house, I found that they need help with everything. I couldn't stop thinking how I can be of any help to these children on my way back home. Thank you all for giving us the opportunity to help the children in Myanmar who are in desperate need. Together, we can make a differnce in young lives. Please click here to see the photos of the Pay-Kyaung Youth Development Center.